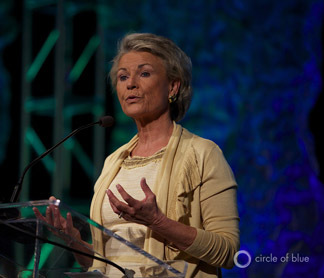 Patricia Mulroy, general manager of the Las Vegas Valley Water District and the Southern Nevada Water Authority, talks with Circle of Blue at the 5th Annual WaterSmart Innovations Conference. Welcome to Circle of Blue Radio’s series 5 in 15, where we’re asking global thought leaders five questions in 15 minutes – more or less. These are experts working in journalism, science, communication design, and water; I’m J. Carl Ganter. Today’s program is underwritten by Traverse Internet Law – tech-savvy lawyers representing internet and technology companies. Our guest today is Patricia “Pat” Mulroy, general manager of the Las Vegas Valley Water District (LVVWD) and the Southern Nevada Water Authority. I caught up with Pat at the 5th Annual WaterSmart Innovations Conference in Las Vegas last week. Pat, it’s great to be with you here in Las Vegas. 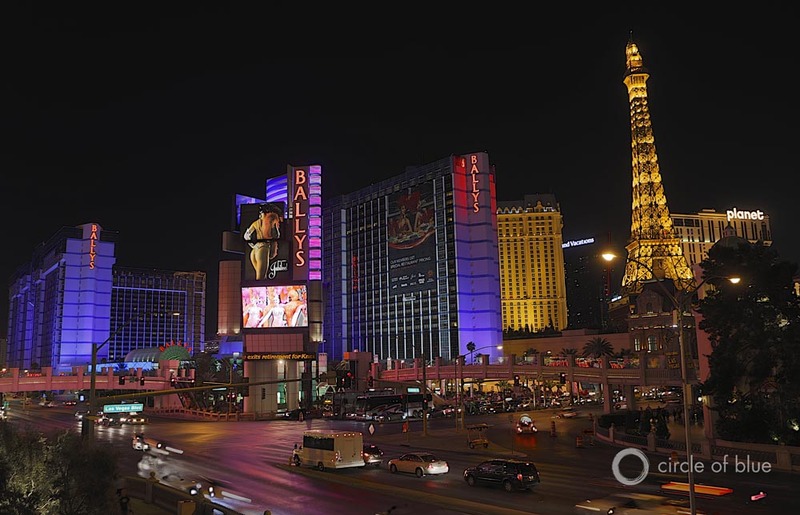 You’ve worked with Las Vegas water issues for more than 20 years — an incredibly dry place! Can you characterize the city’s dual reputation as a casino and gambling center and also it’s other side as a “water-smart” city? Patricia Mulroy, general manager of the Las Vegas Valley Water District. Pat Mulroy: It’s a great contradiction. And anybody who comes to Las Vegas, you know, they stay on the Las Vegas strip, and they marvel at the Bellagio fountains, and they ride the canals of the Venetian, and they go, “Oh my gosh, look at all the water that this community uses.” And when you then tell them, “Well, you know, all that water at all those hotels, is 3 percent of all our water. And, honestly, they are some of the more water-efficient structures in southern Nevada.” We’ve had a major shift in attitude — we had to. And when Lake Mead started really going dry, we confronted some really serious problems. We had, in the ’90s, successfully negotiated with our neighbors the ability to overuse Lake Mead — until it reached a certain elevation, which it then did. And we had put together a resource plan for 50 years, predicated on that absolute belief that was put forth by the federal government, by all the prognosticators, by all those people who wrapped themselves around probabilities that said there was zero probability that this drought would happen. I have become allergic to probabilities. If it’s probable, it won’t happen; if it’s not probable, expect it tomorrow. 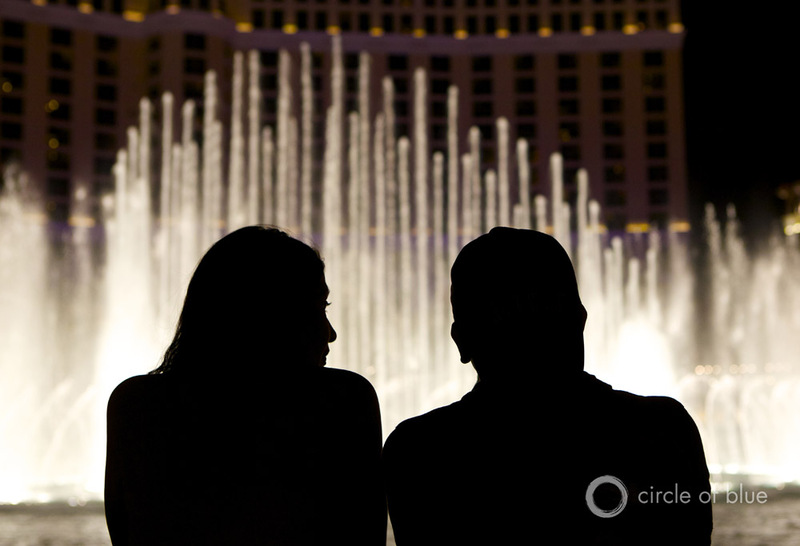 The Bellagio’s spectacular water fountain show at night in Las Vegas. Click image to enlarge slideshow. So we said, “We’ll give them incentives.” Rather than get bludgeoned to death, we raised prices and we have four tiers, but we didn’t feel that was the best incentive tool. We said, “Helping people make the transition — because people want to make that transition — let’s just help them be able to do it.” So we began to pay our customers to take grass out. And, sitting here today, we’ve spent around $US 200 million dollars in direct rebates to our customers to redo their landscaping. And here we sit in the direst spot in the United States and our water footprint, the net amount of water — because we also recycle virtually 100 percent of our water — is 75 gallons per person per day, which is impossible to believe, if you come to this community. And Steve Wynn told me something years ago that has stuck with me forever. “Pat — we sell virtual reality. You’re going to have to work against that.” That’s what we market, is virtual reality. So we want people to come to the oasis in the desert. Not the dry, thirsty, hot, uncomfortable place. But we’ll do it in an efficient way, and we’ll do it in a way where we won’t use it. But you’re always going to hear that there’s this plethora of water use out there on the Las Vegas strip. It has been a journey. And, to me, I’ve always looked at the future of water. Because, as a people, we want that silver-bullet solution. There is no silver-bullet solution. It’s a mosaic; that’s the best way to describe it. And every piece of the mosaic has to be there for the entire picture to come alive. It’s the same with the solutions around water. The foundational piece is conservation. And I don’t care whether you live in New York, whether you live in Chicago, whether you live in Louisville, whether you live in some of the wetter places in the southern United States. We can’t continue to use water the way we do in this country. That’s foundational. It’s a cultural change, and it won’t happen overnight — it’s a journey, and it gets better with every generation. The older someone is, the less likely they are to change. Then there is also — and this is probably where it gets very, very difficult — we’ve, and especially in the West, we’ve been so fiercely competitive. You know, there have been winners and losers. And I’ve had one mission over the last 20 years, and that’s getting people to just drop that veil. There won’t be a winner. All you’re going to have is losers. The whole is greater than the sum of its parts. You’ve got to work as a partnership. But the solutions lie in making all those agreements that we held up as having been etched in stone prove they’re flexible. And they are. I mean, this much-maligned Colorado River Compact, at the end of the day, it allows seven states to do whatever seven states can agree to do, but it allows no one state to roll over their neighbors. Which is, in my mind, the healthiest foundation. There are any number of opportunities to build bridges around water and open understandings between cultures, and these seven states are culturally very, very different — not just politically, but culturally, water-law wise — and now we’re immersed in these negotiations with Mexico, and so a whole other culture is entering into the discussions. But the solutions that we crafted in ’07 and the solutions that we’re crafting now all depend on this partnership. And set aside the notion that there will be winners and there will be losers, because there can’t be any winners. Visitors gape at how much water is used by the Bellagio fountains and the canals of the Venetian, says Pat Mulroy, but the reality is that hotels on the Las Vegas strip “are some of the more water-efficient structures in southern Nevada,” making up “3 percent of all our water.” Click image to enlarge slideshow. There is a lot of talk about pricing water and valuing water to promote conservation and efficiency. What’s the most valuable thing we can do nationally to bring attention to water and these big challenges? Because — whatever stream you’re taking out of, whatever groundwater basin you’re taking out of — there is nothing you can do in this that you don’t have to be careful of whatever consequences you create somewhere else. So water lives in two universes. It lives in this real gray, difficult-to-quantify, emotional realm of, “I can’t live without it, so I have a right to it.” And this, “We’ve commoditized it.” So I push back every time somebody wants to put dollar values on the resource of water. We put a dollar value on the infrastructure of water. We have to find a new way to describe the value of the resource itself. And I’ve been looking for that magic way to describe it, and I haven’t found it yet. And so, these economic conversations about water, you know, I hear water is the next century’s gold, and I just cringe. I mean, these are people who only understand the economic silo, and they don’t understand the fiber and the character of the resource they’re talking about. We can live without oil. We can live without gas. We wouldn’t like it, but we could live without electricity. We can survive as individuals — we can’t survive without water. So it takes on a whole different dimension. It’s embedded in our religions, it’s embedded in everything we do. So the challenge to me is finding that new description of what that value of water is. And it’s got to be described in human terms. What would be the challenges of creating this description and language for water’s value? How much of it really depends on the locality? Pat Mulroy: It depends on how you define “local.” If you said to me, “Water is local here in southern Nevada,” I would define “local” starting in the headwaters in Wyoming and Colorado and ending in the Gulf of Mexico. That’s our “local.” And because of the way we’ve artificially plumbed it, our “local” transcends the Continental Divide, it reaches all the way up to the Bay Delta, it goes into the Rio, it goes everywhere. So “local,” people think, “OK, my community — my neighborhood, my community, my city,” at best. There is an interconnection there. Now, if I live in an isolated little community: ah, but you’re still interconnected. Because — whatever stream you’re taking out of, whatever groundwater basin you’re taking out of — there is nothing you can do in this that you don’t have to be careful of whatever consequences you create somewhere else. And when you take that water, you assume a stewardship responsibility: be it to the environment, be it to your neighbor, be it to whoever exists in that larger definition of “local” community. On a national scale, we’re under a terrific drought this year, nationally, stretching across the country. What about the national understanding of water? What do you see are some of the major ramifications — and maybe even the fallout — from this drought? What are we going to see next year, years from now? Pat Mulroy: If it rains next year, there won’t be a response. That’s the sad reality. It’s something we just take for granted until it’s not there. And then the minute it returns again, we forget about it again. There are books being written that water is not a global crisis — not like the global economic crisis, it’s not something that connects the global populations. The foundational nature of water as the base for that global economy will redefine the global sense of water. Because people do view it as “local.” They say, “Ah, there is no global crisis. There is a multitude of local problems.” Well, take it to the next leve. That message has got to get out there. Then we’ll start looking at it differently. You and I were talking earlier – I mean, look at the way, at the federal level, how we’re organized! We’ve got water split into so many federal agencies: energy is its own thing; and food agriculture is its own thing; bottled water is controlled by the FDA; the EPA controls tap water drinking standards. I mean, how to make sense out of that mess is one of our big challenges. It’s time for a national — there are those that are calling for a national water policy. I push back on that a little. I’ve talked to a lot of my friends in Europe, where the EU, when it was formed, created a European water policy. The problem is they had a one-size-fits-all approach. I think we need to have a national strategy that allows for multiple approaches, and it starts with a national discussion: taking water out of its obscurity, elevating it as an issue. And our elected leaders hesitate doing it, because it becomes instantly divisive. Instantly. It’s ready, shoot, aim. I mean, God love them; they want to come in and have the solution — well it’s not that easy, you know? So it’s time for a more thoughtful U.S. conversation, because there is going to come a day that we’re going to have to have that conversation with our national neighbors to the North and our neighbors to the South and having that when you don’t have an understanding of who your own partners are in this country could be difficult, if not impossible. What role does climate change play in all of this? Is it some external force that is too slow to generate a response, or is it going to trigger some sort of crisis situation and force a response? Pat Mulroy: I don’t want to sound cynical, but having been in this business for as long as I have, I’ve learned that it takes a crisis to awaken people to the reality. Long before you have to deal with… [before] you’ll have any effect with your mitigation, you’re going to have to adapt. And you don’t know what that looks like! Your old security blankets, your Linus blanket of probabilities, isn’t going to do you any good! Because it’s a vast unknown. So it’s going to be a crisis. And I know when the Colorado River Basin’s crisis is going to happen: the day that lake breaks 1075 [feet]. And then, at 1050 [feet] — you know, Mead is full at sea-level elevation at 1220 [feet] — at 1050 [feet], Hoover stops generating electricity. We lose our upper intake, everything changes — a reality that we had thought was firm is gone — and that will be the wake up call. And I think the other thing that has begun to bring — in this community, it had an effect that began the move, the need to adapt, and the need to make changes further up in peoples consciousness — is when it became one of the top three vulnerabilities for economic investment in southern Nevada. And when our water-resource plan had to be attached to every SEC filing, had to be attached to every bond sale, and, all of a sudden, it became one of the top three issues for this Valley, that’s when things changed. Not in terms of somebody having pronounced it, but simply saying, “If we’re going to put our money in businesses and invest in hotels, then we want to know what your resource plan is. Have you looked into the future?” And we all need to. There needs to be a rolling 50-year planning horizon, and I have become absolutely a fervent believer in that, so you can adapt to changes as they occur. Thanks so much, Pat. We’ve been speaking with Pat Mulroy, general manager of the Las Vegas Valley Water District and the Southern Nevada Water Authority. To find more articles and broadcasts on water design, policy, and related issues, be sure to tune into Circle of Blue online at 99.198.125.162/~circl731. This interview was produced by Allison Voglesong. Our theme is composed by Nadav Kahn. Circle of Blue Radio is underwritten by Traverse Internet Law. Join us again for Circle of Blue Radio’s 5 in 15. I’m J. Carl Ganter.